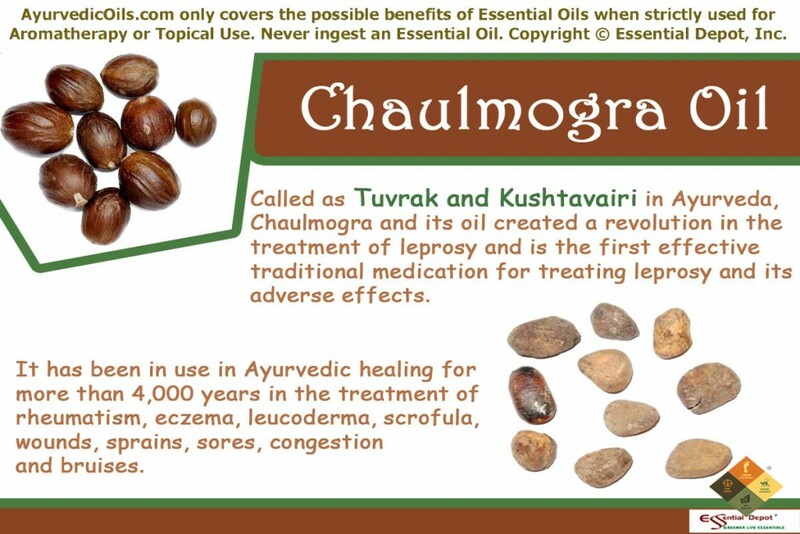 Chaulmogra oil created a revolution in the treatment of leprosy and the first effective drug for treating leprosy used the chemical components of Chaulmogra seeds. These therapeutic seeds are being used in Ayurveda for more than 4,000 years in the treatment of leprosy, rheumatism, eczema, leucoderma, scrofula, wounds, sprains, sores and bruises. Chaulmogra is botanically known to the world as Taraktogenos kurzii/ Hydnocarpus kurzii/ Hydnocarpus wightiana/ Hydnocarpus laurifolia and its Sanskrit name is Tuvrak, Tuvaraka and Kushtavairi. This tall tree is a limb of the Achariaceae plant family. The essential oil is extracted from the Chaulmogra seeds through steam distillation method. Chaulmogra or Chaulmoogra has been a part of the Traditional Chinese Medicine and Ayurveda, the oldest healing science originated from India, especially in the treatment of leprosy and other chronic skin disorders. Chaulmogra tree is indigenous to India and grows extensively in the tropical forests of Western Ghats from Maharashtra to Kerala and is also found in the hilly regions of Tripura and Assam. It is cultivated in Nigeria, Uganda, Sri Lanka and few other South East Asian countries. These evergreen, deciduous trees grow up to 15 m height and bear fruits between the months of August and September. The seeds are angular and ovoid with rounded endings and the essential oil extracted from the seeds are pale yellow in color with viscous and heavy consistency. Chaulmogra oil is called as Oleum Chaulmoograe in the United States and in Great Britain as Gynocardia oil. This oil was used in England in the treatment of lung tuberculosis. Chaulmogra oil was also used in China since the 14th century in alleviating various skin ailments and leprosy. It was slowly then spread to the Western countries including the United States and Europe. A mixture of Chaulmogra oil balanced in gum or as an emulsion was prescribed for treating leprosy. The bark of this plant is used by the people of Arunachal Pradesh, India in relieving toothache and itching. The tribal populace in Sikkim uses the boiled Chaulmogra seeds as a food item. Chaulmogra seed oil was mixed with limewater and was applied externally in treating rheumatic conditions especially in the joints and for relieving sprains. These seeds were also used in folklore as a fish poison. The seed paste along with camphor, sulphur, Jatropha curcus seed oil and lime juice was used in topical application for healing skin ulcers and wounds. The seeds of this tree yield about 32.4 percent fixed oil along with other fatty oils. The major chemical constituents are 49 percent hydnocarpic acid, 27 percent chaulmoogric acid, 12 percent gorlic acid (with these 3 primary components, Chaulmogra is called as triglyceride oil) 6.5 percent oleic acid, 2 percent Palmitic acid, 3.4 percent chaulmoogric acid with lower homologues along with myristic acid, linoleic acid, and stearic acid. These components contribute to its curative properties like antibiotic, astringent, anti-inflammatory, anti-rheumatic, antiseptic, antibacterial, expectorant, decongestant and febrifuge properties. Ayurveda is a Vedic medical science, which is the greatest gift of the ancient Indian Sages to the whole of mankind. Among the 4 four predominant Vedas of Hindu mythology, Ayurveda has its roots to the Atharvaveda and it is also accepted as a supplementary Veda or an Upaveda in its own sacred ways and was enlightened by Acharya Dhanvantari. This holistic healing science is the oldest remedial science on earth and aims at treating illnesses with the help of herbal plants, essential oils, meditation, yoga, simple physical exercises, prayers, an Ayurvedic routine and other proven Ayurvedic therapies like Abhyanga or Ayurvedic massaging and Panchakarma or detox therapies. Ayurveda suggests disciplined ways to fulfill responsibilities or Dharma, lead a healthy lifestyle, aging in the pink and also aims at preventing illnesses and longevity. Charaka Samhita, Sushruta Samhita and Ashtangha Hridaya Samhita are the three greatest Ayurvedic texts that established the basic concepts of Ayurveda and the complete system of medicine. Few noteworthy works are the eight Ayurvedic branches or methodologies of healing. Acharya Charaka (Father or medicine) stands for the Atreya School of physicians and threw light on anatomy, pathogenesis, physiology, diagnosis, etiology, symptoms of diseases along with guidelines for prevention and extended life span. Sushruta (Father of Surgery) is a part of the Dhanvantari School of surgeons. He talks about the categorization of burns, wounds, fractures, rectal surgery, amputation, plastic surgery and various surgical equipments. Sushruta also introduced the art of massaging using vital body points or the marma points in the body. Ashtangha Hridaya Samhita is a combination of Charaka Samhita and Sushruta Samhita. Ayurvedic medicine is based on its four major concepts. They are Panchamahabutas (5 elements of nature), tridosha (3 doshas), malas (elimination of waste) and dhatus (vital organs of the body). This traditional remedy trusts that the world is made up of five vital elements namely earth, water, fire, air and space and everything in the world is also made up of these five elements or the building blocks of existence. Every human being has a unique individual constitution consisting of three biological energies known as doshas. They are vata (air + space), pitta (fire + water) and kapha (earth + water). Vata energy is responsible for the functions of the central nervous system and the autonomic nervous system. Pitta is in charge of tissue building, metabolism, body temperature and functions of the endocrine system. Kapha is accountable for strength of the body, virility, binding power and firmness of the system. Balance between these doshas as per the natural composition indicates health and imbalance due to unhealthy practices, change in food habits and weather conditions causes illnesses. Ayurvedic remedies are prescribed in order to balance these doshic vitiations. The Encyclopedia Britannica says ‘the first textual reference to leprosy—in an ancient Sanskrit sacred work known as the Atharvaveda’, which is the holy book of Ayurvedic principles. It also says that leprosy has been talked about in Sushruta Samhita, the ancient Ayurvedic text, the Hebrew Bible, Chinese medical texts and the writings of the Greek physicians like Galen. Leprosy is said to be the most feared and most misapprehended disease in the history. For thousands of years, the essential oil derived from the seeds of Chaulmogra tree had been in use in the treatment of leprosy and other skin conditions in India, China, Europe, America and certain other Middle East countries. Dr. Mouat tried Chaulmogra in two different ways on his leper patients, one by applying and dressing the external ulcers of the patients with the oil and he also gave it internally in the form of pills, prepared by beating the Chaulmogra seeds into a pulp. It was also introduced as an established treatment for leprosy in 1874 in the Madras Leper Hospital. 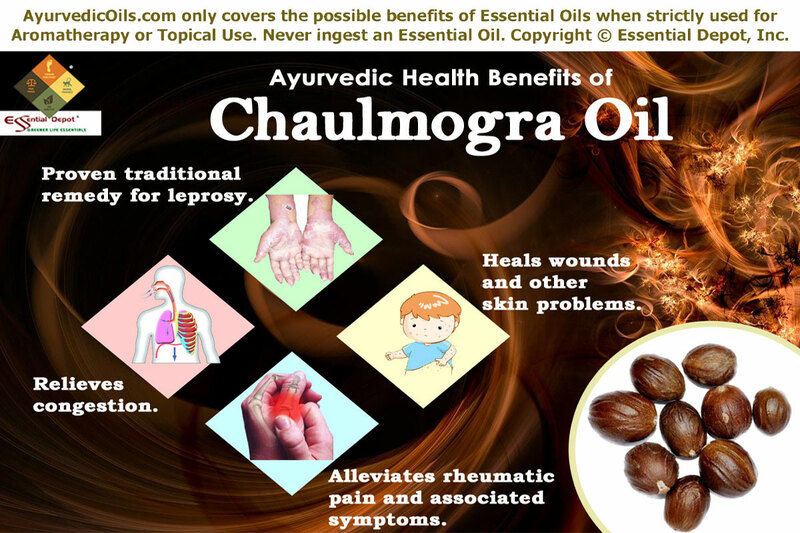 Chaulmogra oil is still being used in Ayurveda, the Traditional Chinese Medicine and even Western medicine for treating leprosy and other highly-communicable skin diseases. Chaulmogra oil has anti-bacterial, antiseptic and analgesic properties that help in healing wounds, prevent it from becoming septic and infectious, kill harmful microbes that may affect the wounds and reduce pain in the injured area. Certain research studies have proved that Chaulmogra oil contains a weak acid known as 5′-methoxyhydnocarpin, which plays a predominant part in preventing the multidrug resistance in certain bacteria like Staphylococcus aureus and this bacteria is often the reason for wounds and infections turning septic. Applying a blend of 1 drop of Chaulmogra oil with 1 drop of Lavender oil in 1 ml jojoba oil can work like a miracle on your skin and aid in healing wounds, cuts, bruises, acne, eczema, psoriasis and sores. Rheumatism is characterized by pain, swelling, redness and inflammation of the hands and legs, especially the joints. Amassing of excess water, toxic remains due to indigestion, salt, uric acid and fat deposits cause rheumatic conditions and it is often regarded as a kapha imbalance. Chaulmogra oil has kapha-reducing and diuretic properties that help in promoting frequent urination, through which the surplus water deposits and toxic remains are eliminated through urine. Massaging the affected parts with 2 drops of Chaulmogra oil blended with 2 drops of Chamomile oil and 2 ml of coconut oil can be a great aid in reducing pain and inflammation with its analgesic properties and discard toxic substances by stimulating the functioning of the kidneys. Chaulmogra is quoted as an oil with sharp and unctuous quality with hot virility and pungent taste by the book ‘Health & Harmony through Ayurveda’ by Anil K. Mehta, R.N. Sharma and N.K. Gupta. These attributes aid in liquefying excess kapha dosha responsible for cold, cough, congestion, tuberculosis and other respiratory problems. Chaulmogra oil acts as an excellent aid in loosening the deposits of mucous and phlegm in the nasal passages, respiratory tracts and bronchial tubes, and helping in the treatment of chest congestion, nasal congestion, bronchitis and tuberculosis. This oil also has antibacterial, expectorant and decongestant properties that help in combating harmful micro-organisms that worsen respiratory infections and promote the expulsion of phlegm. A 1922 study on ‘Chaulmoogra oil in the treatment of tuberculous laryngitis’ concluded that the Chaulmoogra treatment at the Jefferson Hospital and at the Henry Phipps Institute of the University of Pennsylvania on 60 cases over a duration of 8 months “showed promising results from the beginning and in the majority of the cases, Chaulmoogra oil exerted an analgesic action on the larynx, which became more complete after repeated treatments. This study also said that “there was no pain or discomfort in the throat afterward, but rather a pleasing sensation of warmth in the throat and chest.” Throat dryness associated with tuberculous laryngitis exhibited improvement after this treatment. 2 drops of Chaulmogra oil added to steam inhalation or in gentle massage by blending 2 drops of this oil with 1 drop of Tea tree oil along with your decongestant ointment on your chest, throat and back can help in relieving cold, cough, sore throat and congestion. A cup of warm gargle with 1 drop of Chaulmogra oil can help in discarding microbes and microbial infections in the mouth and throat and assist in treating sore throat and dry cough. This information is only for educational purposes and is shared only with the thought of spreading the traditional values of Ayurveda, the ancient wisdom of healing. It is not meant to prevent or diagnose any disease or medical conditions or to replace any kind of professional medical advice or prescribed medicines. Never use essential oils internally. Make sure that you dilute essential oils in appropriate carrier oils before using it externally on the skin, as pure and organic essential oils are highly concentrated substances. Consult your Ayurvedic practitioner or healthcare professional before choosing the best essential oil for your unique individual constitution and state of health. Chaulmogra oil is a non-sensitizing and non-toxic oil but it is good to avoid this oil on children and pregnant women. This entry was posted in Essential Oils - Learn About and Purchase and tagged Ayuredic oils for tuberculous laryngitis, Ayurvedic health benefits of Chaulmogra oil, Ayurvedic oils for common cold, Ayurvedic oils for eczema, Ayurvedic oils for fever, Ayurvedic oils for inflammation, Ayurvedic oils for leprosy, Ayurvedic oils for psoriasis, Ayurvedic oils for respiratory problems, Ayurvedic oils for rheumatic pain, Ayurvedic oils for rheumatism, Ayurvedic oils for skin infections, Ayurvedic oils for tuberculosis, Ayurvedic oils for wounds, Ayurvedic remedies for congestion, Chaulmogra oil in Ayurveda, Chaulmoogra oil, Chemical constituents of Chaulmogra oil, Health benefits of Chaulmogra oil, Hydnocarpus laurifolia, Hydnocarpus wightiana, Leprosy in Ayurveda, Staphylococcus aureus, Taraktogenos kurzii, Therapeutic properties of Chaulmogra oil, Tuvrak by AyurvedicOils. Bookmark the permalink.